30 | Th e M Rep o RT Business Process outsourcing Special Advertorial Section Company desCription A custom business process solutions outsource provider. Global specializes in creating custom solutions for clients in areas such as: accounting, sales, marketing, social media, legal back office, and many other administrative and research based tasks. Each solution provided to clients comes with daily reporting, 24/7 access and escalation to operations, and intellectual property protection. With offices in metro Manila, Philippines; Texas; North Carolina; and New York and U.S. citizens in its operations center, they are able to not only provide a high level of service and transparency, but also provide pain free and long standing solutions. Company history Global was founded in 2006 by four default industry veterans, two of whom manage its office in metro Manila, Philippines and two of whom remain in the U.S. Global got its start servicing several law firms, handling all manner of back office default document preparation. Over the years, Global has evolved and expanded its services to include an inbound/outbound call center, accounting services, staffing, insurance, and SEO tasks, among others, to complement Global's default operations. Global Strategic adapted their old model and developed it into a solutions-centric, transparency- focused, and customer service-oriented product. The company is a master of process efficiency and training, making its folks valued long-term partners, not short-term contractors. Keys to suCCess Transparency and accountability help provide a level of comfort to the client that Global Strategic is doing what the company says it will do and creates a true sense of team. The company's staff is an extension of its office, and by utilizing Web conference and instant messenger applications like Skype, it makes the world smaller and creates a true partnership. Business lines, serviCes, and produCts Global can customize, replicate, and enhance processes for clients in many areas of their operation. They have long-standing experience in the default services, real estate, REO, title, and financial services industries. They now support clients in various verticals, handling all manner of sales, marketing, data entry, QA, research, and accounting related services. GeoGraphiCal sCope and CoveraGe area Global Strategic is an international company with clients in the United Kingdom, Australia, Philippines, and the U.S. Competitive advantaGe The company's offshore team has a combined 30 years' U.S. industry expertise. Its daily allocations reports are founded on a meticulously created and maintained set of metrics, and its train the trainer program gives every client the peace of mind that its offshore staff is managed and trained and that its performance is maintained by Global, not the client. Key Features/BeneFits Global maintains a brick and mortar operations center in metro Manila, Philippines. Unlike many competitors in the outsourcing space all of Global's employees work onsite within a Biometric Entry and ISO 27001 Certified Operations Center. Global boasts: • U.S and offshore operations • Three U.S. citizens on site in the metro Manila office in management and training roles • Two training rooms, a cutting-edge approach to cross-training and scalability, an ISO 27001 data security and integrity certified, biometric entry, and 24/7 security and operations General Data Entry • Establish task procedures (playbooks) • Utilize process matrices and checklists/cheat sheets • Designate resources to audit work output • Administer regular coaching sessions to review overall performance of resources/teams • Hold calibration calls to revisit procedures and/ or standard processing times • Daily/weekly review of audit results Call Center • Real-time monitoring of agent activities • Live barging of calls • Reviewing of call recordings to measure quality and verify call results • Administer regular coaching sessions to review overall performance of resources/teams • Daily/weekly review of audit results • Hold conference calls/meetings to discuss SLAs added value to Clients Global provides detailed FTE (full-time employee) reports that are tailored to each client. 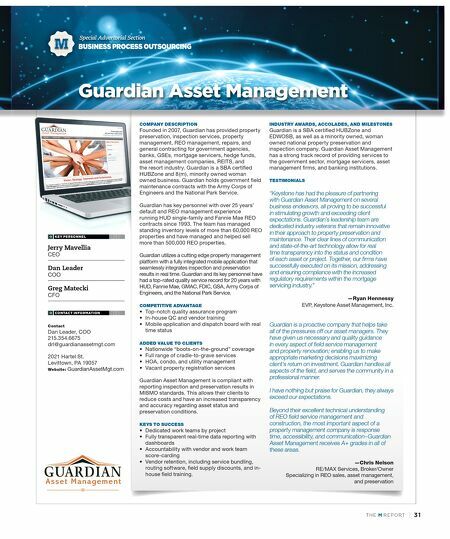 Additionally, they construct a client user manual for each client, which provides added intellectual property protection for their clients. Their trainer process ensures that for every facet of your operation that you outsource with them you will never have to manage, fire, hire, or train in that area again. Keys to their success are a dedication to transparency and a process improvement with their clients' back office operations. 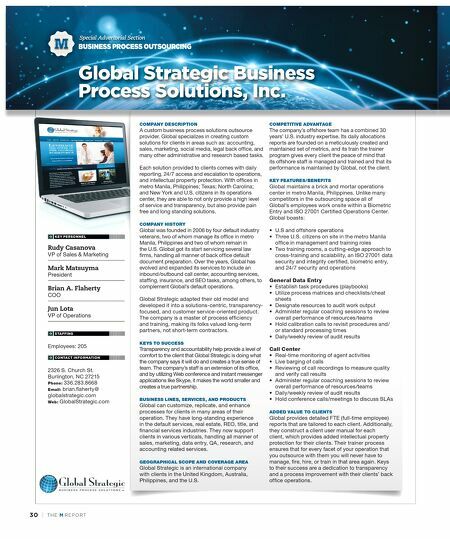 key personnel Rudy Casanova VP of Sales & Marketing Mark Matsuyma President Brian A. Flaherty COO Jun Lota VP of Operations staffing Employees: 205 contact information 2326 S. Church St. Burlington, NC 27215 phone: 336.283.8668 email: brian.flaherty@ globalstrategic.com Web: GlobalStrategic.com global strategic Business process solutions, inc.